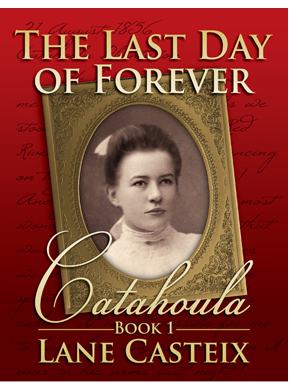 What follows is a brief excerpt from chapter 1 of The Last Day of Forever, which I hope to have published in early February. Enjoy. My breathing slowed as I swung my feet out of my bunk and onto the floor. That dream, I had not had it since I was a young boy. Why now? I thought. Why now? I dressed myself and joined my mother, Analee, for a breakfast of eggs, bacon, grits and biscuits prepared by Mabel Honeycutt, the captain’s wife. “You sleep well?” my mother asked as I took my seat at the table. “A little while ago,” she replied before taking a sip of her café au lait. I pushed my plate aside, its contents half eaten. “Nothing. I’m fine. I’m going topside,” I announced before pouring a tin cup of black coffee and heading up to the hurricane deck, my refuge on these trips on the Shreveport Belle. “Morning, Ethan,” said Captain Honeycutt when I entered the wheelhouse. Captain Jonathan Honeycutt knew the river as well as any man alive, both the Red and the Mississippi. He was mostly soft spoken with a quiet manner about him, but perfectly capable of making a deckhand think the wrath of the Lord was upon him if he did wrong. He was also a student of the Bible and frequently quoted verses from memory. Being something of a student of the Scriptures myself, we often discussed the Bible when I had occasion to travel on the Shreveport Belle. But not this morning as I wanted to be alone to clear my head. I excused myself and took my cup of coffee and found my usual seat on the bench directly in front of the wheelhouse. On my little bench high above the activities on the decks below, I had a commanding view of the Mississippi as we churned south to New Orleans. And it was peaceful there, with only the reassuring throb of the steam engines and an occasional whistle greeting between passing riverboats. I stretched out, crossed my legs and leaned against the back of the bench while I sipped my coffee and slipped into my thoughts. That dream was still troubling me. Even though it had been a many years since I last experienced it, I knew in my heart it meant something. If nothing else, it had influenced how I felt about the “peculiar institution” of slavery. There were other troubling “peculiarities,” so to speak, such as Brandy, my mother’s personal servant. Her mother was Martha, our mammy back at Catahoula Plantation. Mammy was very light skinned, some said at least a mulatto and maybe even a quadroon, having the white blood of some previous owner flowing through her veins. Brandy was as white as I was, even lighter, considering I was usually sun burnt from the performance of my chores caring for the animals at Catahoula and providing fresh game and fish to add variety to our meals. She was not only fair, but also very comely with dark hair and hazel eyes, and the smoothest skin I have seen on any woman. We were like brother and sister, as she was born the same day I was. She more lived the life of the pampered daughter of the plantation owner, and it was whispered among the slaves that Brandy’s father was Morgan Davis, my mother’s husband. That would indeed make her my half-sister. When I asked my older half-brother, Peyton, about that, he only warned me not to listen to the tales the darkies tell. But I could not escape the feeling that Brandy was a slave trapped in a white woman’s skin, a foot in each world and a member of neither. I shook my head as if to rid it of those thoughts­­—and that dream. But I could not shake the feeling that my life was about to change, and I admit I was a bit anxious about that. Some of that change was expected, as I would soon turn eighteen and be off to school at the Virginia Military Institute. This would be my last summer of adolescence. But another change loomed, one I was unsure of, because Morgan expected me to play an important role in it, one I was not all together comfortable with. He leaned forward in his chair and continued reading as if he had not heard me. His expression grew ever more grave. I knew there had to be more to it than that, and there was. Nice Mississippi riverboat vibe and story teaser. I can’t get into the blog though. Not sure why. Bubby, I think I owe you a pizza. We can discuss it then, but I need to move SPAR first. Hope that is done by first week in February. Love the two points of view… and the cliff hanger!